Thierry Bornier is a French photographer who didn’t follow a traditional path into this field of art. He graduated with a MBA in finance and started his working life as a Chief Financial Official for international fashion companies in New York and Shanghai in the first decade of 2000. However, numbers didn’t satisfy him in the way that subjective beauty in nature and fashion does, and he continued to pursue a career in photography. Perhaps the thing that strikes me most about Thierry’s poetic images of China is that it is very much a manmade and managed landscape, and also a peopled landscape - a celebration of the old ways where, yes, man exploits the resources that he has around him but does so in a way that leaves room for nature. The scale of the views that he represents, whether terraced rice fields or fish farms and the inclusion of the human form – often from elevated viewpoints or in sweeping panoramas – also serves to emphasise that we are but a small part of this earth. I was born and raised in France. As a young man, I loved water sports and activities such as swimming, scuba diving, surfing and water skiing. After my army service, I went to study accounting at university to obtain my Bachelor of Arts in accounting and pass my CPA (Certified Public Accountant) exam. Later I graduated with a Master of Business Administration (MBA) degree in finance (mergers & acquisitions of a company). How did you come to live in China, and what changes have struck you most in the time you have been there? Landscape photography is the only religion I practice and nature is the only spiritual book of my life. It's only when I'm connected to the world of beauty, that I can conceive art. When did you become interested in photography and what kind of images did you initially set out to make? My company asked me to return to the USA because my job in China was complete, but I did not feel like returning and wanted to stay in China. I decided to take a break in my life and a year off to travel around China which was at this time still very untouched by modernisation, so I bought a camera, a Nikon D700, to capture some images during my trip. I went to Southwest China and travelled in Yunnan, Sichuan and Guangxi Province and I started to enjoy my encounters with all these different minorities, which was so exciting. The biggest impact during my travel came from the rice field terraces of Yunnan. Without any experience of landscape photography, I made some images and one of them was published in National Geographic as Photo of the Day. This experience totally changed my life and career because I had to make decisions about my future, and it was not easy to choose between a life of security or a life of adventure and challenges. What made you then commit to developing as a career what was – at the time – your personal photography, to take the risk and move away from secure employment, rather than simply continue with it around your (then) job? I always say life is about 2 things: feeling and choices. I had to make a big decision because, for me, it was a huge challenge not only to change career but also to reach a level and achieve expertise about China landscapes, as well as photography skills. I have decided to give it three years of my life to be sure I could reach my objectives and that I had a plan. Considering I’ve never studied photography, I knew it would take time and I also needed to survive. Life is to open doors, and these doors open others and bring you somewhere. You need to not only work hard but also to be lucky sometimes. My first target was to learn photography skills not just with the camera, but also to understand lighting which is the key for me in photography. Without any conceptions of photography, I decided that in order to make money to survive and be free I should open a studio to shoot wedding and fashion photography because in China the market was so huge with opportunities. It took me over one year to learn fashion photography online and look for inspiration from some famous photographers and understand what made them different and unique. I spent hours watching YouTube videos about their shooting, and step by step my insatiable curiosity let me find some important clues and techniques about lighting. My next move was to try and apply them in my own studio. Before readers become wholly envious of a life spent amid wonderful landscapes, am I right in thinking that commercial and fashion work underwrites your landscape photography? Fashion photography, portrait photography and landscape photography have different approaches and different environments. For the former two, we deal with people in the studio and it is not easy as we have to build the light; as for landscape photography, nature builds everything for us before our eyes, but the most complicated part is the lighting because it is out of our control. We need luck. Sometimes people see amazing images with incredible weather conditions and light, and many say what great photographers we are, and I tell them no, it’s how lucky we are because we can’t control the weather - that’s why I spend a lot of time in one place to get my ideal image. I would imagine all kinds of scenarios of lighting and mood that I can get in a particular place, and when I have this ideal image in mind, I just need to stay as long as I can or come back until I get it. One of my images took me three years to obtain what I expected for the place: landscape photography is about patience. How proud are you of being self-taught and does it make you do anything differently or give you any competitive edge? I don’t think I’m proud to have learned photography by myself, because if you really want to achieve anything in your life, you must first believe in yourself and be very curious and keep trying, working hard and never giving up. For my part I am never satisfied with my work, it is the only way to improve, and life, after all, is to learn always until the end. I think the advantage to be self-taught is that I’m able to shoot anything and that is great. I can use my Phase One for my landscape photography workshop and use my Nikon to shoot my portrait photography or commercial work in the studio without any problem. I have two philosophies of work and have two different technical approaches to reach my target. Who (photographers, artists or individuals) or what has most inspired you, or driven you forward in your own development as a photographer? My favourite fashion and portrait photographers are Peter Lindbergh, Irving Penn, Richard Avedon, Helmut Newton and Yousuf Karsh. I also love some painters such as Leonardo de Vinci (genius of humanity), Monet and Van Gogh. I have studied each of them to find their style as fashion photographers or some specific lighting as their own signature, the same for the painters: what story they want to tell, and the lighting inside the paintings. Regarding landscape photographers, I have been intrigued by some photographers but none of them has really helped me to find my own style because I do believe photography is based on our personality. When I shoot a place I’m not the only photographer: I can be on a workshop with many people, but when we review our images they ask me why they look so different. I explain firstly, we all came from different backgrounds - just like the differences between Van Gogh and Picasso, they had different lives and education, and their motivation to create varies. Our life is unique because of our childhood, our emotional encounters, the things we are sensitive about, and that makes all the difference in our works and the way we see the world, our own world. But I should mention Sebastiao Salgado, he inspired me a lot with regards to black and white photography, as well as Ansel Adams. I am curious about how Ansel Adams would approach his works today with a digital camera. Which cameras and lenses do you like to use? Has this changed over time? I used to only use Nikon, as my first camera was a Nikon D700 and I always upgraded. Today I do use a Nikon D850 but mostly for my fashion and portrait works. After I sold my first photo – “Hani Terraces”, the one that was published in National Geographic – I bought my first Phase One IQ280 CCD and to date, I always use it for my landscape photography. I never use wide angle and most of my lenses for my portrait and fashion shooting are 85mm f1.4 and 70-200mm f2.8, for my lifestyle photography I’m using 35 mm f1.4. For my landscape photography with my medium format Phase One camera, I use 150mm, 80mm and 55mm. I never upgrade my Phase One because I love my CCD sensor. Can you give readers an insight into your workflow from the point of image capture through post-processing to output? When I capture images from one place, I will wait for a few weeks before looking at them to digest my trip and the location. Then I will choose only one image to process - by then I know which one I like the most. For this one image I use Capture One to correct my RAW image, and then make some further corrections in Photoshop, but I won’t change my images because I refuse to do so - I only correct contrast and adjust colours because cameras don’t have eyes and brains so we must compensate for this. All these mistakes appear because we are using digital cameras and cameras can’t see. I have never done HDR photography in my life because it does not represent my personal approach in photography. I use my cameras only in the simplest way possible as people did before with film: manual mode with ISO, aperture and shutter speed. I use a polarizer and ND neutral filter, and one year ago I started using my Big Stopper when there are thick clouds. For portrait photography, I refuse to retouch people’s faces because it will make them unreal and I believe they will lose their identity. As Peter Lindbergh said, there is no beauty without truth. From what I’ve read, you’re very persistent and will spend a long time working towards a single image. Can you tell us a little about your travels – where you like to go, how you get to your elevated viewpoints and how long you will stay in a place or how often you will return to achieve the outcome that you have in mind? I always know very well the places I go after many years, but also sometimes I discover new places, so I need to know when is the best time of the year for the weather is. For example, there are five main areas of rice field terraces in China and if you take only the one in Yunnan, the best time is January to March because before that there is no water. So you must have good knowledge of the places and have connections with local people because with the climate changing it affects your work. These local people always contact me to let me know if it is going to rain or snow because this is valuable information that lets me decide to go or not. Regarding the viewpoints, I try always to find the best high vantage point that I can to make my images; I have never used drones. I go back many times to the same places because the scenarios of lighting or mood won’t be the same; when I have my mental image I will go until I get the mood I want - some pictures took me 2 or 3 years of my life. Would you like to choose 2-3 favourite photographs from your own portfolio and tell us a little about why they are special to you? This image is a story of patience and, most importantly, of luck. I have been many times to Yellow Mountain in Anhui province. On this night I woke at 2am and climbed the stairs to reach the point of shooting. When I arrived, I could see a white sea of cloud which was not moving without being able to see clearly what shape it was. After waiting a few hours at minus 10 degrees Celsius, after dawn, I realized the wonder of nature and saw the sea of cloud moving so slowly that I didn’t need to use any filter or long exposure, and captured this image at only 3 seconds’ shutter speed. An old photographer living there told me later when he saw my image that this chance encounter with nature happens maybe only once in a century. I did not process this image in Photoshop and it is 100% natural. This image is the most important one not for the quality of the image but because it made me change my career forever. I was travelling for one year to take a break from my stressful life as a CFO. This image was taken with a Nikon D700 and I had no experience at all in photography, but National Geographic selected the image as a picture of the day. A few months later the German company Siemens bought the image for 5 years’ worldwide advertising use for 40,000 Euros. I immediately used the money to buy a Phase One IQ280 camera and decided to try to become a photographer for the next 3 years and at the end of this go back to finance if I couldn’t reach the level I wanted to. This image was captured in Xiapu Fujian Province; it also has a story because I was the first photographer to shoot this place, just after it was built. My local friend called me and told me a new place will soon be ready, so I took the high-speed train from Shanghai and reached Xiapu. The next day I went visit the new site and I made my first 2 pictures there including Pastel Floating Dream. I sold this image in Shanghai to a collector for 20,000 USD for a Limited Edition print 2.5 metres in size. Xiapu is one of my favourite places in China. I have made a lot of abstract pictures there and have already been 30 times in the past 6 years. I organize many workshops there and go to places people don’t know. It’s a very unique place and I can talk about it for hours; it is another man-made place but this one is so different because they have to replant the seaweed which is farmed in the mudflat year after year when the typhoon season is over. My images are based on moods and stories because you need to tell the story of the places you shoot, even if sometimes there is no one in the images, the lighting and the mood becomes the story. 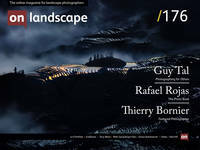 One of the things that strikes me most about your images is that it is very much a man-made or managed landscape, but also a peopled landscape. In the west, we spend a lot of time seeking ‘natural’ looking landscapes and avoiding obvious signs of human influence (which isn’t always so beautiful). How important are the farmers and fishermen in your images, and what have you come to know of their way of life? What changes or challenges are they experiencing? That is a very interesting question and I guess after living in China for 12 years I have seen all the man-made work in this country such as the rice field terraces, and of course, sometimes you need to tell a story about these landscapes and the people who made them, such as Xiapu Mudflat in Fujian. Behind these landscapes, there is an amazing story about how the men and women created and maintained them for thousands of years, the same now as exactly 2000 years ago for the oldest rice field terraces. My images are based on moods and stories because you need to tell the story of the places you shoot, even if sometimes there is no one in the images, the lighting and the mood becomes the story. During my workshop, I teach people more to look and understand what they want to shoot. I ask them to keep the camera in the bag and take their time to look at the landscape and to feel it and get the best impression of it. After that, I ask them what and how they would like to paint it if they were painters. Then I ask them to use their imagination, take the camera out and start to shoot what they feel. An image is not made by a camera, but by your soul and heart; the camera is only 5% of the image, the rest is about creativity, about us. Now all these beautiful places made by people such as the rice field terraces will disappear soon because the new generation wants to work in big cities instead of being farmers because living in big modern cities means a better quality of life. I have also seen many beautiful places completely destroyed and lost for the genuine part of it because of modernism and tourism. Is it important to you that people see your work in print, and how do you choose to print and present your pictures? Now I sell my prints in Limited Editions of 6 for each image for 20,000 USD for a print of 2 to 3 meters, and I only use the famous iconic German company Hahnemühle. Hahnemühle Fine Art – Germany’s oldest artist paper mill – has been making artist papers for traditional painting and printing techniques for more than 425 years. The Digital Fine Art Collection combines the elegance and uniqueness of genuine artist papers with the impressive look of modern Fine Art prints. What reaction have you had to your images in China? From a short spell in Hong Kong I know that landscape was relegated to backdrop in images of self and family – nearly 20 years before ‘selfie’ became common parlance – and I wonder if your work has helped people to better know and appreciate their countryside, and perhaps to recognize the value of protecting and conserving it? I have received messages from Chinese photographers or Chinese people saying they never knew their country was so beautiful until they saw my images and they want to go to these places, and I think it is good because my images have promoted this beautiful and unique country by showing its diversity of places and moods. I find that Westerners still don’t come here that much, probably because they don’t feel safe, or for other reasons, but living here for 12 years I can assure you that China is the safest country in the world because there are no weapons here and they have the best infrastructure including high speed trains and the best airports. The food is amazing, and the only problem is the language because 85% of the people here can’t speak English. Do you have any particular projects or ambitions for the future or themes that you would like to explore further? Do you have any plans to photograph in urban environments or other countries? I’m still focusing on China because I’m a specialist in this country as a landscape photographer and I do speak English, French and of course Chinese. In the near future, I will publish a book about China called “Vision of China”. I do organize a few workshops in China every year to help people discover this country but I’m not doing tour photography - my workshop is really to teach people photography based on my experience and I spend a lot of time to take care of each of them, which is why my workshop groups are in small, 4 to 6 people maximum. In 2020, I will start to shoot some other countries and work with local photographers to explore the best of these new photographic opportunities. If you had to take a break from all things photographic for a week, what would you end up doing? Do you have other hobbies or interests? When I come back from my workshops or my personal trips, the first thing I love to do is to cook because I love cooking. I also love music and movies so I will spend time at home to relax and do some sports before my next trip. And finally, is there someone whose photography you enjoy – perhaps someone that we may not have come across – and whose work you think we should feature in a future issue? They can be amateur or professional. I know a Chinese gentleman - Zheng De Xiong - who made a small place called Xiapu in Fujian Province famous throughout the world; he has been photographing this amazing place for 15 years, and I respect him a lot. Thank you for sharing your story with us Thierry, and congratulations on finding your dream and making it work for you. If you’d like to see more of Thierry’s images you’ll find his website here.